We’re starting with a BANG, kids. Seriously. This is probably in the top 10 of my all-time favorite meals, and DEFINITELY my fav Japanese bar food. The great thing is, it’s EASY to recreate at home and tastes JUST like the real thing, promise. So, if you’ve been dying to know what my childhood tasted like when I was underage drinking in Tokyo and eating too much bar food? Look no further. I know, such a relief. And, may we also take note that bar food doesn’t usually include fried poppers of any kind, and very little dairy? It’s relatively….healthy. Which is weird but great. 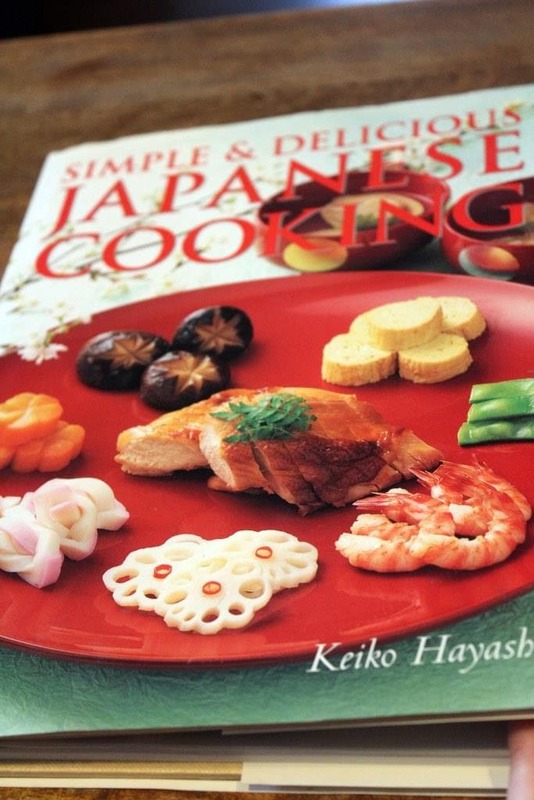 When we lived in Tokyo, my mom took a cooking class by the woman who wrote this book – a cookbook that I use ALL the time when I want to really Japan it up. 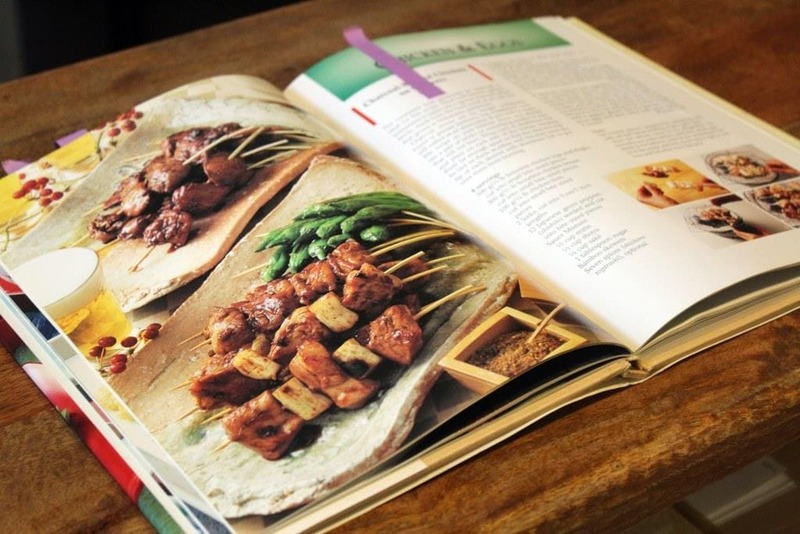 The recipes are incredibly simple, and much like other countries’ cuisines, if you have a few staple ingredients and spices you can make a ton of different dishes. This dish uses mirin, a sweet cooking wine, and sake, rice wine, and if you have those on hand you can make tons of Japanese sauces and dips. Mirin and sake are found almost anywhere, but if you don’t feel like buying sake you can sub white wine – I’ve done it before and it’s just fine! 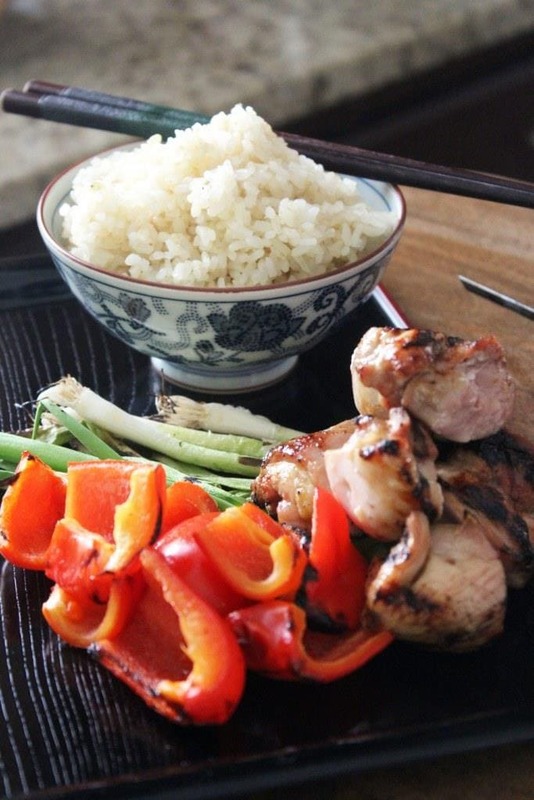 Besides the sauce, we char some veggies and chicken, make some rice, and we have dinner. This whole mess can be made in WELL under an hour, and it’s just so tasty and delicious – DEFINITELY appropriate to celebrate the man who offered sperm to give you life? Or a man that’s dedicated time and energy to making your life better? Doesn’t have to be biological, fathers can be found in all forms. Let’s get right to this. Gather up some chicken, peppers, green onions, mirin, soy sauce, sake, and sugar. That’s it! You can use any veggies you like, so sub whatever you have. 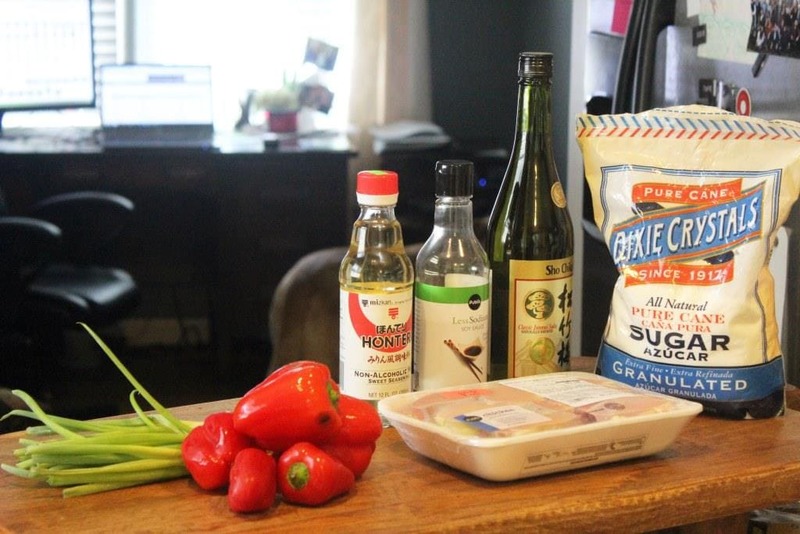 For the chicken, I like boneless skinless chicken thighs – I find that they have more flavor than breast meat and aren’t as likely to dry out on the grill. Plus, they’re cheaper! 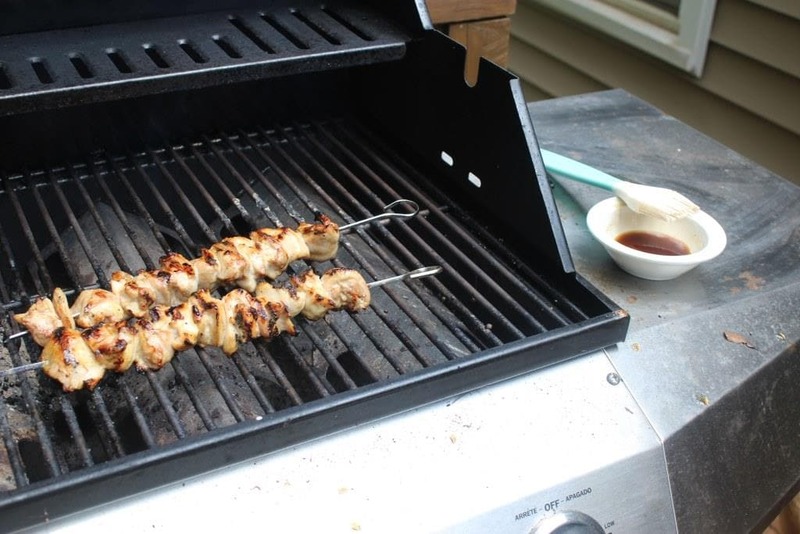 First, preheat your grill to HIGH while you prep the sauce and the ingredients. 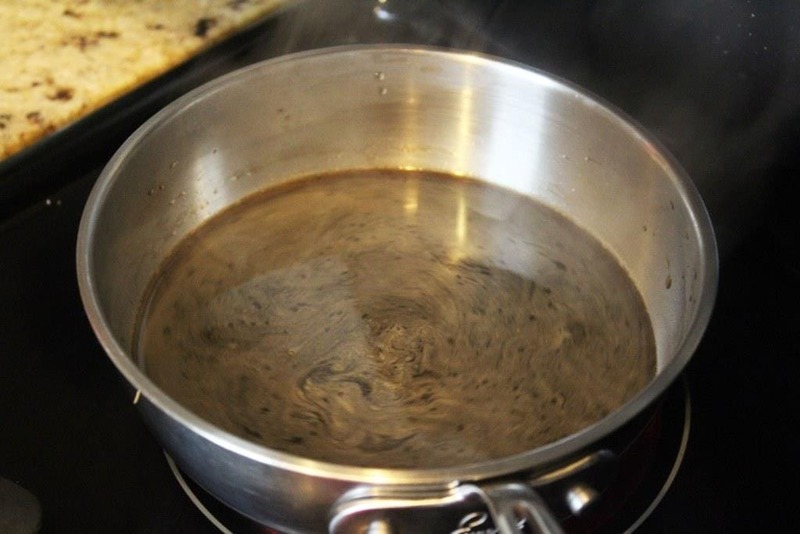 For the sauce, add all the ingredients to a small pan and bring to a boil, stirring every few minutes. When the sauce boils, turn it off and let it cool and thicken in the pan. Now, the veggies! I char the green onions as they are, but feel free to skewer them if you’d like. 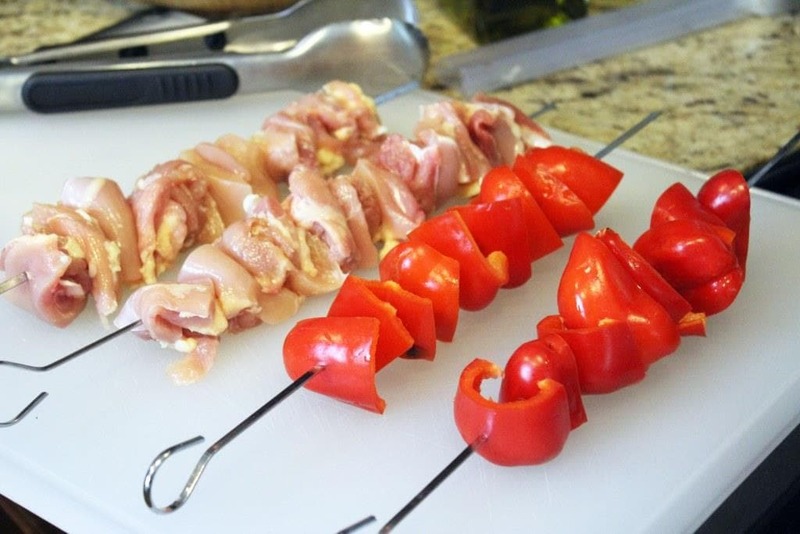 For the peppers, I cut them into bite-sized chunks and thread them onto long skewers…. ….then I repeat with the chicken. Squish the chicken close together so it’ll char nicely but not dry out on the grill. At this point, we should have a hot grill, cooling sauce, and prepped meat and veggies. Go ahead and start some rice if you want to eat some and if you haven’t done so already. Then, let’s grill! I started with the green onions because they take SECONDS on a hot grill. Lay them over the grates, turn just once when they start to darken, then remove almost immediately. We want the outsides to char but the insides not to get too mushy. 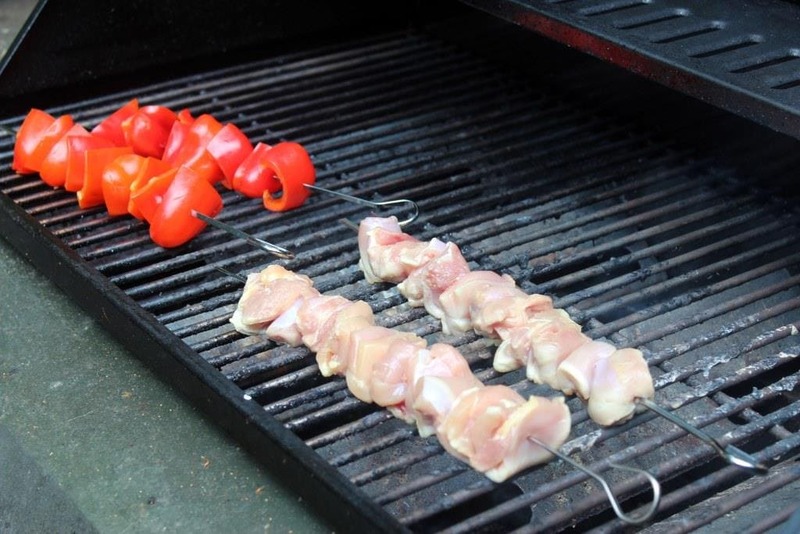 Then, the chicken and skewered veggies go on, and we’re using the same method. There’s no seasoning of any kind used yet, and we really want to blacken the edges of the chicken and veggies. Let the chicken cook for about 6 minutes on the first side, then flip it once some of the edges have charred. See? The chicken is still raw on the middle but dark on the outside. Cook the chicken for about 5 more minutes. When it’s ALMOST done, brush the sauce you made on the chicken and veggies, turning once more to char the sauce just slightly. And that, my friends, is it. We have rice, charred veggies, chicken brushed in the most delicious sauce, and there’s just nothing better in this life whatsoever. Definitely serve any extra sauce you have on the side for dipping – it adds a great richness to the dish. AND. Did you notice that there is zero fat added to the dish? If you want to oil your grill that’s fine, but other than that no fat is necessary to achieve a really perfect flavor. 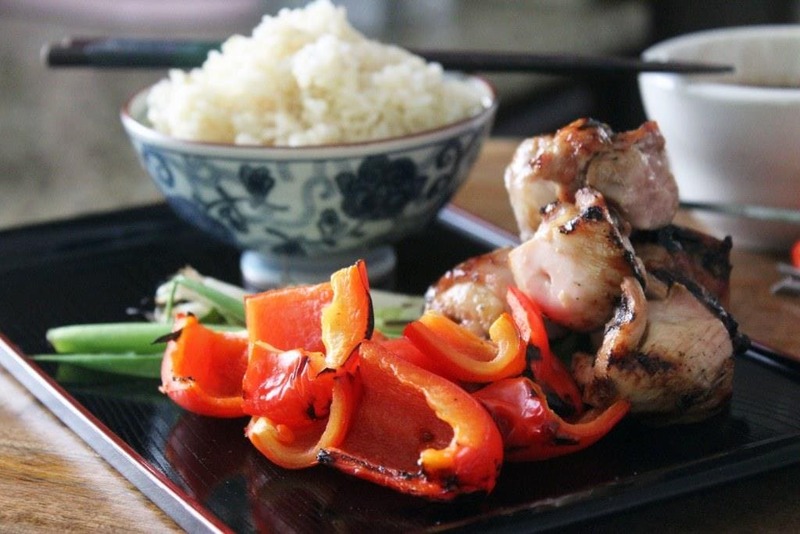 I like to serve about half a skewer of meat per serving with some of the veggies, rice, and sauce in a small dish for dipping. GORGEOUS. I know this is slightly off the path we usually go on this website, but you 100% need to trust me and try this. It’s SO simple and delicious – add some sake or Asahi to drink, and BOOM. Japanese pub (isakaya) all the way. Definitely a cool idea for Father’s Day or, heck, Monday! For the sauce, combine all the ingredients in a small pan over medium-high heat. Bring to a boil, stir, then turn the heat off. Let the sauce sit and cool gently while you prepare the rest of the meal. Preheat the grill to high. 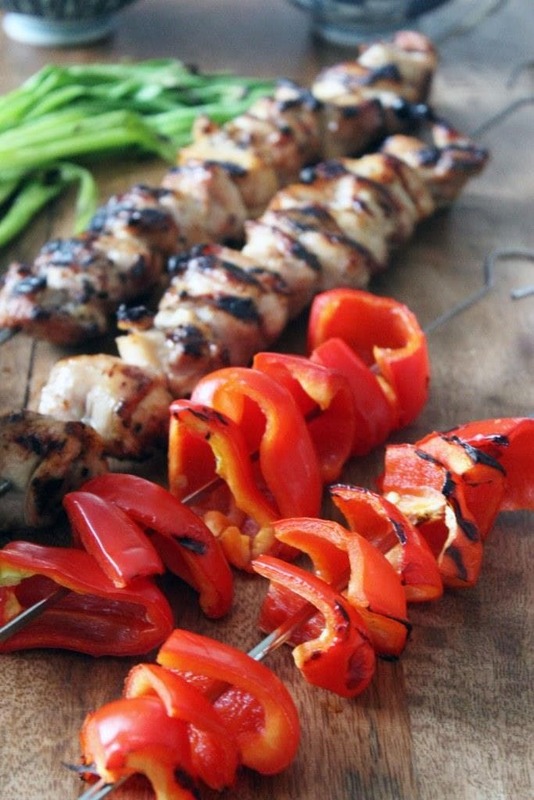 Thread the peppers onto long skewers. 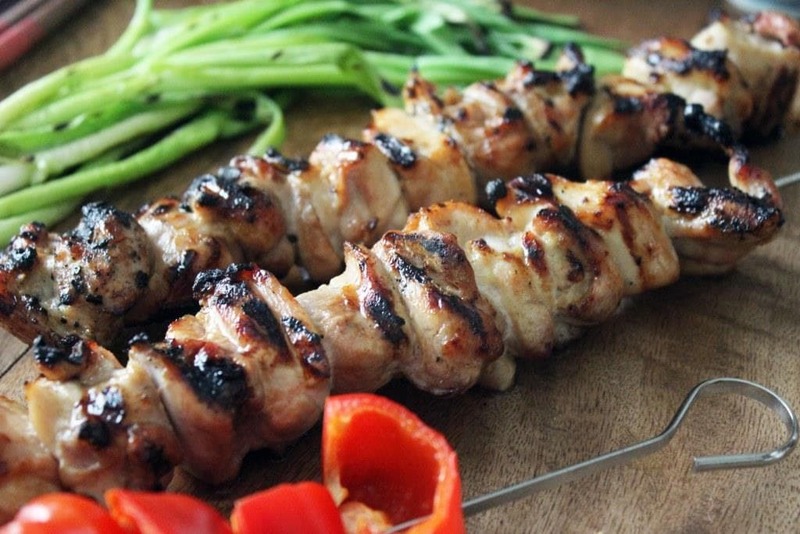 Cut the chicken into bite sized pieces and thread them on skewers as well. 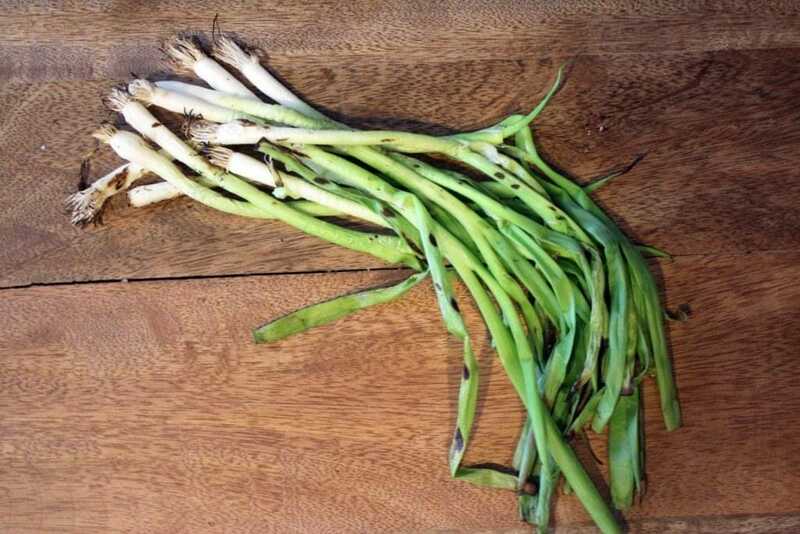 To cook, grill the scallions whole for about 30 seconds on each side just to char, then remove from the grill and set aside. 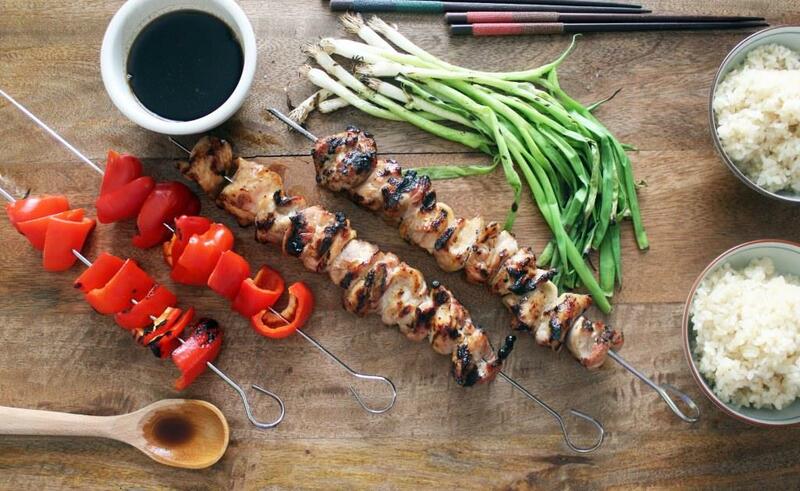 Grill the skewered veggies and chicken for about 5 minutes on each side until black edges form. When the chicken is nearly cooked, brush with the cooled sauce all over, then remove from the grill. If the veggies cook faster than the chicken, remove them first. 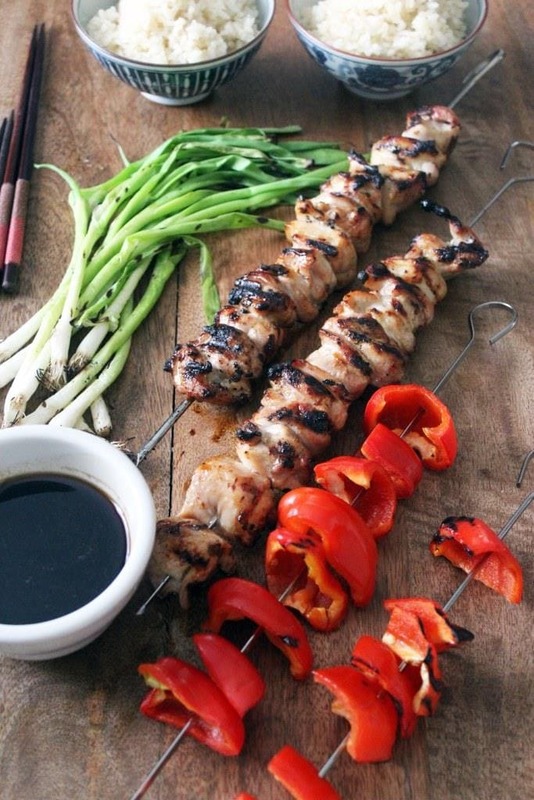 Serve the skewers and scallions with cooked rice and extra sauce for drizzling and dipping. 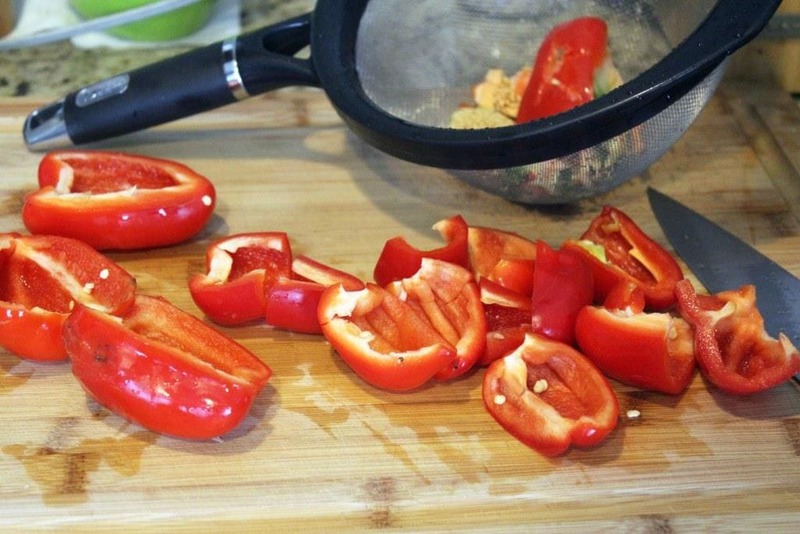 Use any veggies you like for grilling - mixing it up is always fun! This dish is traditionally served with chicken, but other proteins would be delicious with the sauce. 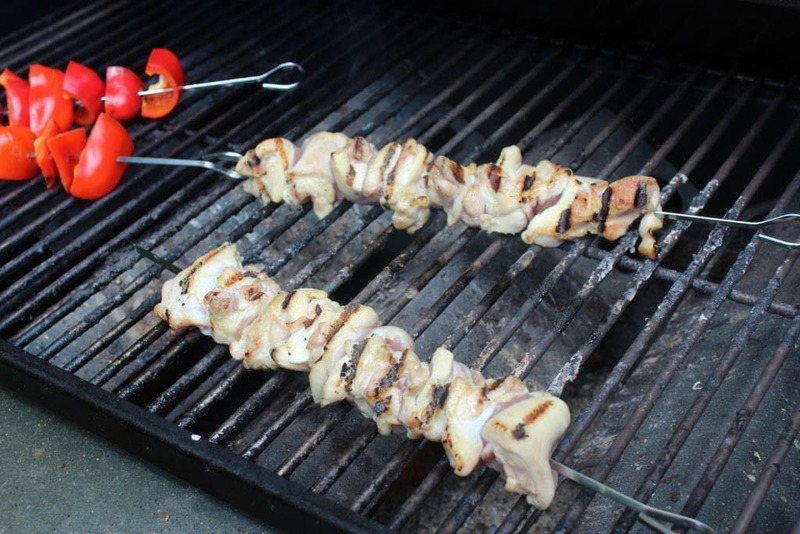 When skewering the chicken, fold up any longer pieces or tuck in any stray edges to form neat skewers of meat pressed closely together. This will ensure that the chicken stays moist.